A Stihl line trimmer, whether curved or straight, has a flexible drive shaft that connects the trimmer head to the engine. This shaft is inside a housing, and when it wears out or breaks for some other reason, it's an easy task to remove it from the housing and replace it. Unlike some other trimmer models, a Stihl's design allows you to extract the shaft without disassembling the shaft housing from the engine. A broken shaft causes a Stihl trimmer to vibrate excessively. The failure of the trimmer head to spin when you engage the throttle isn't necessarily a sign of a broken shaft -- it could also be a broken clutch. When the shaft is broken, however, you'll notice excessive vibrations in the shaft housing or in the handles. These vibrations are caused by part of the shaft knocking against the shaft housing. If the shaft isn't broken all the way through, the trimmer head may spin erratically. Erratic head operation can also be a sign of clutch malfunction, but not if the tool is vibrating excessively. You can access the flexible drive shaft by removing the trimmer head. Before doing that, remember to disable the trimmer by pulling the spark plug wire off the plug. Then, insert a pin in the end of shaft to prevent the shaft from spinning so you can unscrew the trimmer head retaining nut and remove the head. Once you've taken off the head, you need to remove the gear housing, which is secured by an easy-to-release clamp. You'll also have to unscrew a retaining screw. Once the gear housing is gone, you'll see the end of the flexible shaft. After gripping the end of the flexible shaft with needle-nose pliers, work the shaft out far enough to grip it with your fingers, and then pull it the rest of the way by hand. Nothing is holding it in the shaft housing, so it should slide right out. Replacement shafts are model-specific and available from a Stihl dealer or through the Stihl website. Coat the replacement piece with lubricating grease before feeding it into the shaft housing and pushing it as far as it will go. The end of the shaft has to engage with the clutch, so you need to twist the shaft back and forth to find the proper orientation before it will slide in all the way. The shaft usually comes out of the housing in one piece, and if it needs replacement, it has usually turned blue. 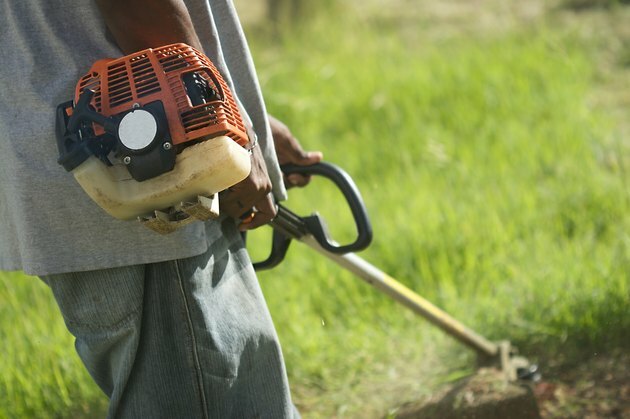 If you jam the trimmer head against a rock while it is spinning at full throttle, however, the shaft may sever. To get the upper part out, you may have to disassemble the shaft housing from the engine housing. To do this, disconnect the throttle cable and disconnect the ignition wires. Then unscrew the locking bolts and pull the shaft housing free. After removing the upper part of the flexible shaft, reassemble the shaft housing to the engine housing before installing the replacement shaft.